Father's Day Council of Victoria Inc. | Recognising the important role of fathers in family life. 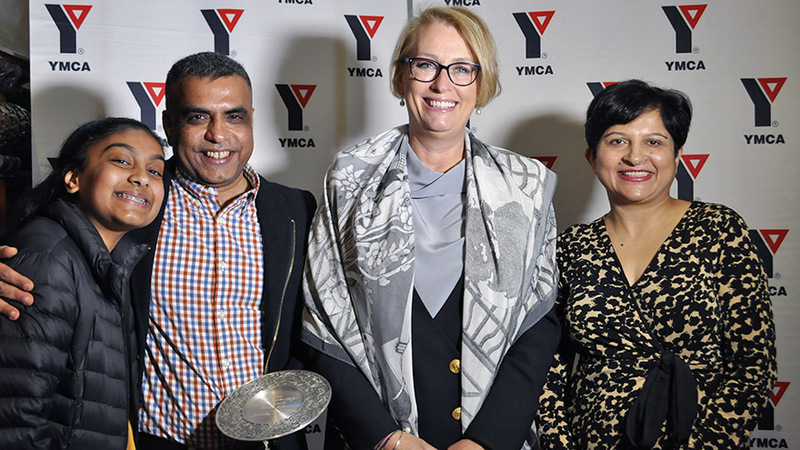 YMCA Victoria in association with the Father’s Day Council of Victoria has announced 49-year-old Melbourne man Sandeep “Sunny” Jadhav as the Victorian Father of the Year for 2018. This is the 62nd Year the Victorian Father of the Year has been awarded. Sunny’s story is about a father and father-figure who continues to go above and beyond for thousands of young people, always with a positive attitude. He is passionate and dedicated to mentoring the next generation of Australia’s brightest doctors, surgeons, pilots and engineers. Born in Nagpur, India, Sunny immigrated to Australia in 1996 and has lived in Melbourne for over 10 years, prior to this he lived in Sydney. Although he works tirelessly as a Land Maintenance System Electrical Engineer for the Defence Force, his true joy comes from teaching and inspiring others in maths, science and engineering subjects. For over 15 hours a week, for the past 16 years, Sunny has tutored primary school aged kids, VCE and university students and army officers from all cultures and backgrounds. All of this time and effort is voluntary. Sunny currently has about 200 mentees, all of which have come through word-of-mouth and personal connections. Sunny’s motivation to help and give back to the community goes beyond his home and workplace. His wife Kiran says it is difficult to go to the local shopping centre in Yallambie without stopping every five minutes because someone wants to ask him something. “We will get in a taxi and he will start helping the taxi driver out. He doesn’t just give advice, he gives connections. He will say: ’I’ve got a friend at Centrelink, or, I know this great job going and can speak to them.’ He shares his networks. He just loves to help. Shruti’s 9-year-old son has been mentored by Sunny for four years. She says his passion and dedication to young people is admirable. Many of Sunny’s students have gone onto become pilots, surgeons, doctors and scientists across Australia. And some have helped him when he needed it most. When Sunny’s wife Kiran was in hospital in 2014 he was surprised to discover a former mentee was the endocrine specialist treating his wife. “I was in tears to see my mentee as the briefing surgeon,” Sunny said. As well as being a dad to others, Sunny is dedicated to his family. He takes his daughters for runs twice a week at 5.15am, cooks breakfast for the family, makes his wife chai tea, drops off and picks up his daughters from school, helps them with their a homework. In the summer months he plays cricket with his family. “It gives me purpose in my life and satisfaction. I just love maths and science and the application to the outside world and teaching this to others. As well as being a huge advocate for the importance of STEM (science, technology, engineering and mathematics) subjects in Australia, Sunny believes voting should be lowered to 16 to ensure we are listening to the voices of young people and keep them engaged and involved in politics and policy making. “They absolutely understand what is right and wrong for them,” he said. Chair of the Father’s Day Council Barry Novy said the award celebrates and acknowledges the often unrecognised commitment and support fathers and father-figures provide in our communities. He said in the 62nd Year of the Victorian Father of the Year he was honoured to present the award to a father who goes above and beyond for others. “The Council and YMCA received over a thousand nominations from across the state for an outstanding father figure. Since 1956, the Father’s Day Council of Victoria has named a Father of the Year for Victoria, to celebrate and recognise the important role fathers and father-figures play in family life. For the past thirteen years the YMCA has partnered with the Council and co-ordinated the local YMCA Community Father of the Year in every region where there is a YMCA. The Father’s Day Council of Victoria considers all YMCA Community Father of the Year recipients when selecting the Victorian Father of the Year as well as nominations directly submitted to the Council.